Head skimmed, new valves, new valve guides, new valve seals. The engine has no key, just an on switch and a start button. If you are concerned with theft, there is an engine start cut out switch located just under the floor at the base of the companion way steps. The benefit of not having a key (we have witnessed this scenario more than once) is other cruisers can jump aboard and rescue the boat if you are absent and the anchor drags. Start the engine and give it 1500 rpm, this helps get water flowing. Very occasionally - not happened in recent history - an air bubble gets into the salt water pump which causes cavitations and no water will be expelled with the exhaust. It is a very easy solution, with the engine running loosen the hose clamp on the exit to the pump, slightly remove the hose, let the air and some water out and reconnect. We typically run the engine at 2000rpm and get 4.5kt, not great speed but only 3/4 gallon per hour (1500 at anchor charging batteries, if possible in reverse for engine load). If need speed, 2800 rpm will give 6kt again in relatively flat conditions. Never exceed maximum rpm minus 200, usually around 3300. Do not exceed 1500rpm until engine at 60 degrees. If the tachometer starts flickering, or reads lower than you feel it should, the fan belt will need tightening. See maintenance for tips. There is no engine hour meter hence every time you start and stop the engine you need to record the time. I will leave copies of all engine logs since we owned the boat. I have a stop solenoid in place in the engine and also a stop cable running to a lever in the cockpit, however I have never got around to completing the solenoid or going back and reconnecting the cable, hence to stop the engine you need to pull the emergency stop lever located on the front of the engine. It is incredibly easy to get to and not a hardship, you could continue to operate the engine this way indefinitely. The transmission is a Borg Warner Velvet Drive 1:1.91 Drive Ratio. The transmission was completely re-built in 2001 and does not leak. Based on a letter from the manufacturer, at the speed a sail boat goes, having the prop spin under sail is not a problem for the transmission. Based on this we have no prop shaft lock and, better yet, we have no drag caused by a stationary prop. Transmission is connected via a brand new 1 1/4 inch propeller shaft (old one tested straight and is in stbd lazarette as spare) to a new propeller 16X12, we also have a spare propeller a 19x12. The spare propeller is really to big for this engine (max 2000 rpm obtainable from engines max of 4000) but it is fine to have as a spare. It is located under the floor in the Stbd Lazarette. Oil change:I replace the oil and filter every 100 hours. When I first got the boat it came with a little syringe pump and both myself and the boat used to get covered in oil. I have since purchased a self contained pump/tank that makes the job extremely simple. 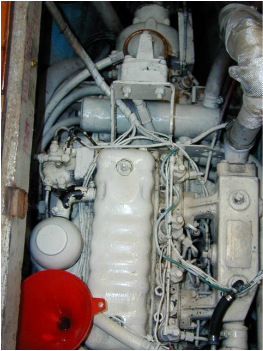 This container is stored by the engine cooling water seacock (tight fir but best use of space) and its corresponding hoses are in a blue Tupperware on the second shelf at the NavStation. Connect the hoses to the pump/container making sure you remove the plastic disk under the screw cap. The pump handle looks like it should attach to the container at the back, it has never fit this connection, just leave it to the side. With the engine warm (Not too hot otherwise the plastic tubing used will implode and hamper the 'sucking' operation) remove the dipstick and feed the small tube down until you feel it hit the bottom. Sometimes it slides easily round the base of the sump and you miss where the 'Bottom' is so try again turning the hose 180degrees to induce the bend the other way. There is a clip on the hose, squeeze it shut. pump the pump 30-40 times until it gets hard to pump then release this clip. You will see oil coming up the tube into the viewing tube just before the container. You may need to repeat the clipping/pumping/releasing operation a few times. It is obvious when it is finished as you will hear slurping noises. Pump up one last time then wiggle the tube around to try and get as much out as possible. Don't forget the oil filter, there is a removal tool in the tray by the Racor filters under the galley floor. Smearing oil on both sides of the top gasket helps with a good seal. When re-filling with oil (SAE30 only - if you use a multi-grade you will find yourself burning through oil, no obvious smoke but you keep needing to top up) add 4 litres and start the engine. After a couple of minutes (to allow the oil to get into the pipes and the new filter), stop the engine, let settle and top up to max. Heat exchanger zinc every couple of months. Heat exchanger was brand new in 2001 so I am pretty good on ensuring this is changed regularly. The replacement zincs are in the 4th drawer down next to the washing machine. Some are too long and need to be cut down to size with a hacksaw. Either length is marked in pen or measure off a smaller one. If you need to replace the fan belt, they are a little tight to get on and the engine will need to be turned over (wrench on main crank nut) to slide belt over the pulleys. The monster screwdriver I will leave is good for leverage, I also use a small crowbar, not leaving. As 150Amp alternator is pretty big for only one belt it needs to be tight but I have had no problems with this set up in 5 years. If you ever need to remove the exhaust manifold (access to injector pump/starter motor) you will need to drain the coolant and remove header tank. I have put a break in one of the pipes that runs to the hot water heater located just aft of the stbd aft engine mount. I then hang a gallon jug down below the transmission and drain into that for re-use. Takes 2 jugs so I pour into a bucket and do the second. Next the top bolt arrangement on the injector pump needs to be removed, the whole thing 7/16ths not 5/16ths. Take extreme care to keep clean and cover hole you leave with tape. This is the anti stall device, not part of the bleeding routine (see fuel). The instant I have the manifold off, I replace this arrangement until time to put manifold back on, I am just paranoid about getting dirt in the pump. I have run out of Maniseal but it is excellent for adding to the exhaust gasket when reconnecting. Make sure you thoroughly scrape off any old residue from the manifold and engine block then smear a tiny bit on both sides of the gasket. It expands as it hardens ensuring no leaks.